Bathtubs, swimming pools—liquids in general, really—are the natural enemies of books. Get one wet, even once, and it’ll never be the same again. So too electronics, which makes many of the places we like to read—at the beach, in the bathtub, or anywhere water is present—a risky location. That’s not the case with the Kobo Aura H2O. As its name implies, it’s designed to wade into water and come out the other side unharmed and ready to use. Unfortunately, a number of disappointing quirks prevent us from giving it a strong recommendation. The H2O isn’t waterproof, but its IP67 rating means this e-reader is dustproof and highly water-resistant. 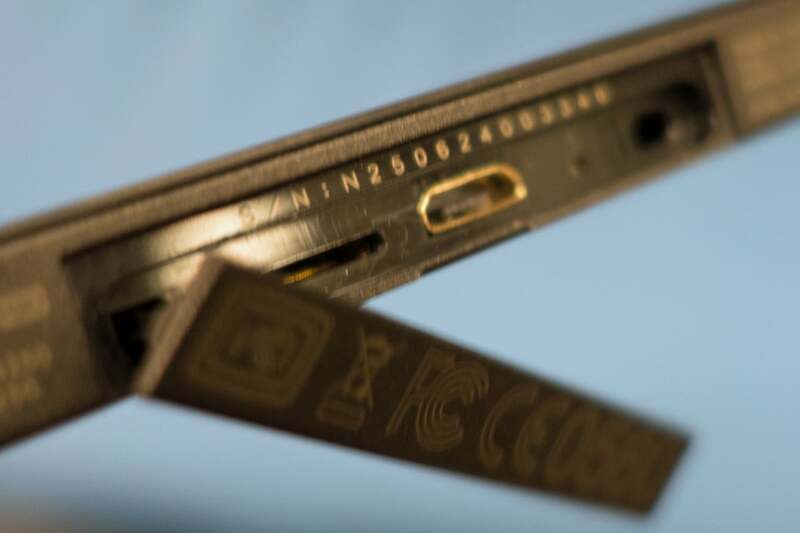 The 6 means it can be submerged in just over three feet of water for up to 30 minutes and come out ready to use, and the 7 means it’s completely protected from dust. This is due in part to a plastic cover on the micro-USB port and microSD card slot located on the bottom of the device. I have some concerns about the long-term durability of that cover, which connects to the H2O by way of a thin plastic tang. Opening and closing the cover every time you want to charge the H2O or fiddle with a microSD card could cause it to break free of the e-reader over time. The rest of the device, however, is solid as a rock. If you do get it wet, the H2O’s rubberized plastic body will help to ensure that it doesn’t wind up being too slippery to hold on to. This is furthered by the e-reader’s blocky, angular design. Measuring 7.04 x 5.07 x 0.38 inches in size, the H2O is larger than Amazon’s Kindle Paperwhite and weighs roughly an ounce more. An ounce doesn’t sound like much, but when you’re talking about something designed to be held in one hand, perhaps in front of your face while you lay on your back in bed, even that bit of extra weight can matter. I found the H2O to be less comfortable to hold for long reading sessions than the Kindle Paperwhite was. 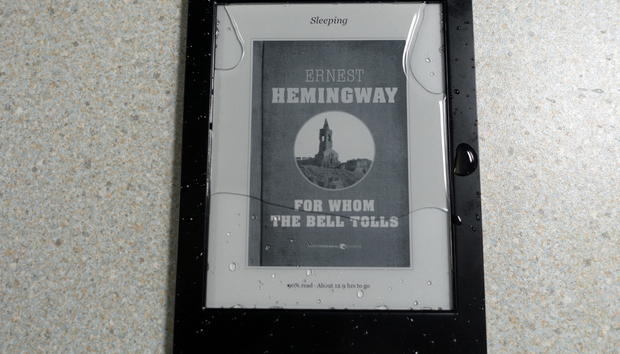 The Kobo Aura H20 stays water tight, thanks to a port cover on the bottom of the device. 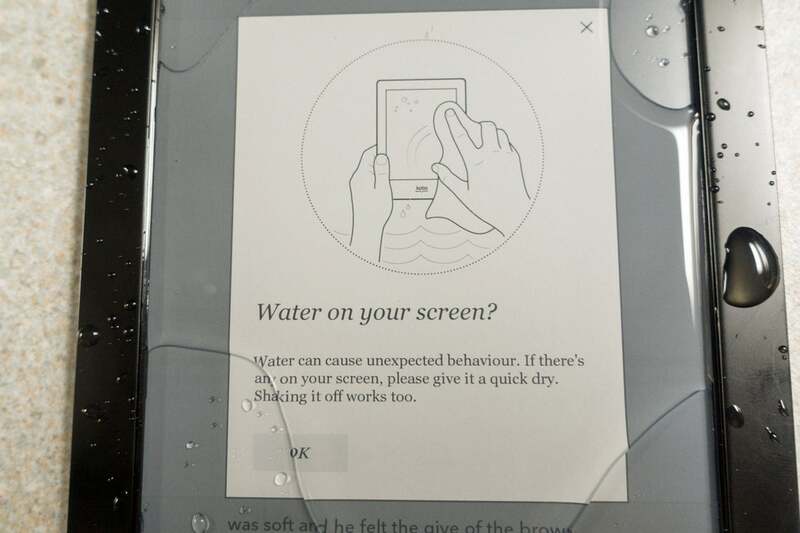 As with the other Kobo readers, the H2O offers no buttons for turning pages; in fact, there are buttons at all, apart from a power button on its backside. You’ll need to poke at the H2O’s display to interact with it. And I found myself doing a lot more poking than I really wanted to, because it frequently took more than one tap before it registered that I wanted to move to the next page of the book I was reading. You can change the areas of the display that register page-turn requests, but doing so didn’t resolve the issue for me. At 6.8 inches, measured diagonally, the H2O’s display is close to a whole inch larger than what you get with Amazon’s Kindle Paperwhite or the Kobo Glo HD. This translates into fewer page turns to read a document. But H2O’s lower resolution—265 ppi, compared to 300 ppi on the Kindle Paperwhite and Kobo Glo HD—made reading less enjoyable. And while the H2O’s backlight seemed brighter than that of the Paperwhite, The H2O’s light seemed murkier. Text was readable in all conditions, but the displays in Amazon’s top three e-readers (the Kindle Paperwhite, Voyage, and Oasis) are of higher quality than anything in the Kobo line. Not sure what water looks like? The Kobo Aura H2O has your back. The H2O comes with 4GB of onboard storage, which is enough space to hold thousands of books downloaded from Kobo’s eBook and Magazine store. And if you ever run out of room, you can add up to 32GB of additional storage via microSD card. This is great news, considering the vast selection of literature their online store currently offers. While it’s not as expansive as Amazon’s Kindle eBook store, you’ll have no trouble tracking down most popular and classic titles. The H20 can handle a host of document file types, including CBR, CBZ, EPUB, EPUB3, HTML, MOBI, PDF, RTF, and TXT; and a wide range image file formats, including BMP, GIF, JPEG, PNG, and TIFF. Unfortunately, reading documents other than E-books on the H2O can be a nightmare. The device’s unresponsive screen makes it difficult to pan around and zoom into large documents such as PDFs, and when there’s a lot of information on a given page—complex illustrations or photographs, for example—the H2O will all but freeze as it tries to render them. After 20 minutes of trying to read the latest PDF edition of Foreign Affairs, I simply gave up. The periodical froze up for minutes at a time with every turn of the page. You’ll be fine if you can stick to the books available through the Kobo online store, Pinterest (which is integrated into the reader’s OS), or loans from local libraries through Kobo’s OverDrive service. But the Kobo H2O is a big disappointment for those of us who prefer to roll our own reading material. If you frequently read in or by the water, the Kobo Aura H2O will survive a dunking. But if your reading habits more typically leave you landlocked, you’d be better served by a less-expensive and more-capable alternative, such as the Amazon Kindle Paperwhite or the Kobo Glo HD.